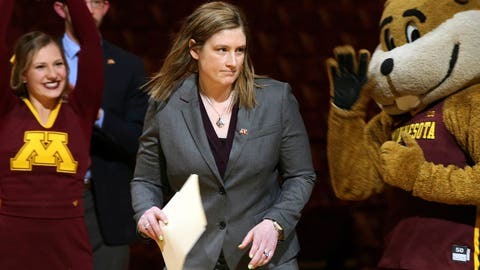 NEW YORK — Getting ranked so quickly wasn’t on Lindsay Whalen’s mind when she took over the head coaching job at Minnesota this season. Whalen enjoyed tremendous success as a player at the school in the early 2000s, where being in the AP Top 25 was commonplace from the middle of her sophomore season on. She helped Minnesota reach the Final Four her senior year. It only took one win to get her team ranked in her first year as coach as the Gophers entered the poll at No. 25 on Monday. It’s the first ranking for the school since 2015. The opening win over New Hampshire on Friday drew more than 14,000 fans. “It’s only one game and we have a lot of work to do,” she said. Minnesota has a favorable schedule with just one road game — Wednesday at Xavier — over the next month. Whalen became the 39th person to play and coach a team that was ranked when her alma mater entered the poll at No. 25. Whalen is the 12th to do it at the same school. While Minnesota entered at No. 25, most of the poll was relatively unchanged. Notre Dame, UConn, Oregon, Baylor and Louisville still are the top five teams. The Irish are no longer a unanimous choice by the 31-member national media panel. They lost one first-place ballot to Oregon, which rallied to beat No. 18 Syracuse at home on Saturday. Top 25 teams went 39-1 against unranked opponents this past week with then-No. 21 Duke suffering the only loss with a defeat at Northwestern.